I created Stirling engine software to help designers and enthusiasts build high-power Stirling engines. This software is a design program geared to helping you design the various components of a Stirling engine for maximum power and efficiency. It’s practical and straightforward to use, and laid out in a format understandable to a layperson; meaning you don’t have to be an expert to use it. Included with the software is a 144 page information manual that gives an in-depth description of Stirling engines. Every effort has been made to make the information in the manual as clear and accessible as possible. There is no confusing jargon or obscuring of detail. I created this program and manual with clarity in mind because I wanted to help bridge the knowledge gap between those who understand Stirling engines and those who don’t. There’s a lot of quality information out there, which unfortunately is scattered and hard to understand by the average person. Over a time period of a year and a half I read all the information I could get my hands on. I also went through some serious design efforts of my own in order to gain a practical understanding of these engines. The end result is a practical information manual and design program. What was my motivation for creating Stirling engine design software? It’s simple. I wanted to create something of value to someone who wants to design and build a high-power Stirling engine. Never mind all those cute little models you see on YouTube, which anyone can build. I wanted to put together a guide for building an engine that will put out serious power! That said, I did not create a fabrication manual that tells you how to machine the different parts, or how to join different metals together. And I did not create a guide that tells you how big to make the linkages and crankshaft so that they can support the piston forces. Instead, what the program does is give you the information you need to figure these things out, based on the dimensions and type of materials you are using in your design. For instance, the program will give you information such as pressure, temperature, and speed, which you can use to calculate how strong to make the components. The program might also tell you why that engine you once built isn’t running. Needless to say, I am passionate about Stirling engines. They are impressive machines deserving of serious attention. And this is especially true now given that demand for alternative energy sources is growing faster than ever. Note that the Stirling engine software program is only for kinematic engines (with prescribed piston/displacer motion). It does not model free-piston engines. 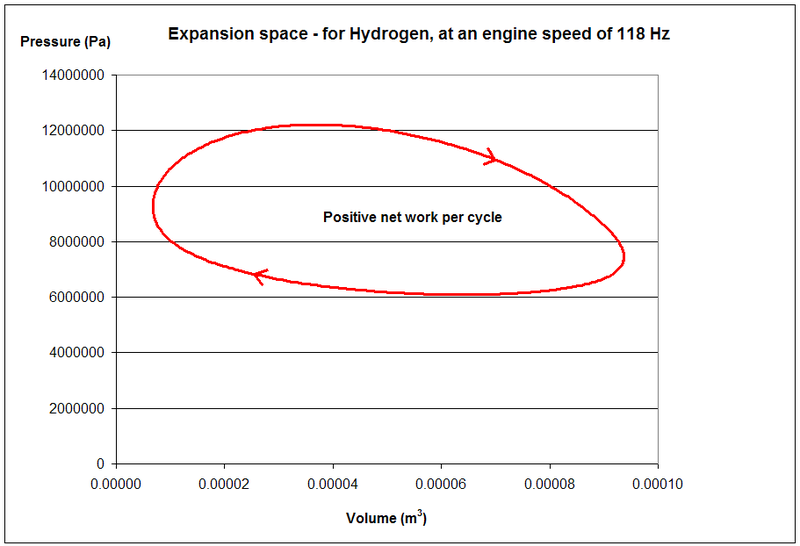 However, its performance predictions can still be used for comparison purposes with existing free-piston engines. For instance, the simulation results produced by the software program were compared to the data results given in the following report: Design study of a 15 kW free-piston Stirling engine – Linear alternator for dispersed solar electric power systems, by G. R. Dochat, H. S. Chen, S. Bhate, and T. Marusak, August 1979. The comparison was independently done by someone else, who informed me that the simulation results precisely match the results in the report, for a 5 kW free-piston engine. The free-piston engine, described in the report, was treated as a beta engine in the program input. This allowed for direct comparison between the report results and the simulation results. The program only models alpha engines with two pistons, and beta/gamma engines with one power piston and one displacer. The program does not accommodate engine designs with multiple pistons/displacers operating in multiple cylinders (such as the Rinia configuration). This can be done with some extra programming effort, but as of right now this feature is not included. The program is a simplified third-order model, based on the report by R. D. Banduric and N. C. J. Chen: Nonlinear Analysis of Stirling Engine Thermodynamics, Oak Ridge National Laboratory, June 1984. "Optimal design of the heater of a Stirling engine coupled with a fluidized bed combustor", S. Lombardi*, K. Bizon**, G. Continillo**, F.S. Marra***, 2012. See reference . Click on the five links below to see graphs taken from a sample simulation using the program. 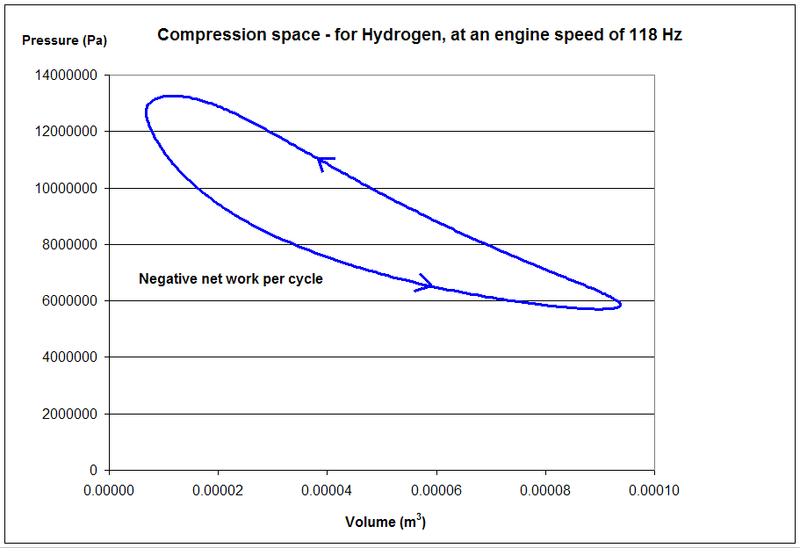 Note that the speed shown in the graphs is in Hz (revolutions per second), and is for hydrogen as the working gas inside the engine. Hydrogen has low density and low viscosity. This results in very high engine speeds (since pumping losses are lower). 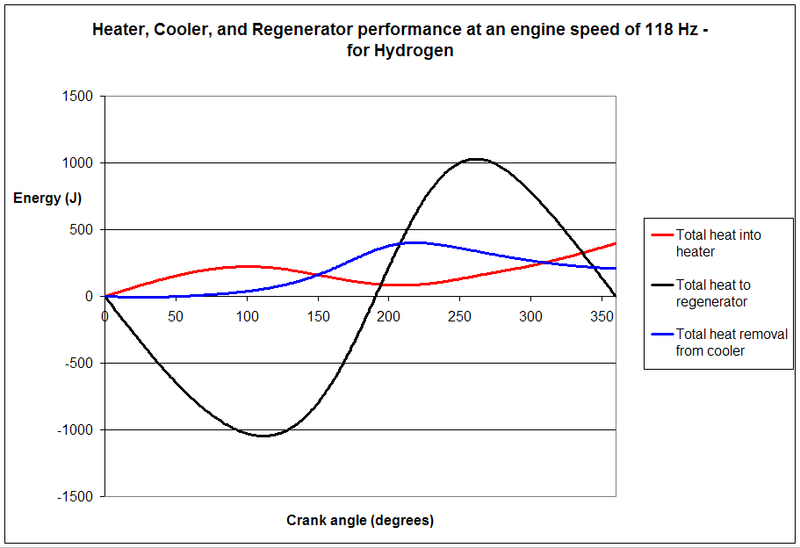 The MOD II Stirling engine, developed in the 1980s, used hydrogen as the working gas, and it reached speeds comparable to the speeds shown in the graphs. At peak power it ran at about 4500 rpm which is 75 Hz. Also, note that predicting engine speed is among the biggest uncertainties, which is why in the design manual that comes with the program I give a speed tolerance of +25/-30% from the nominal speed value predicted by the program (as shown in the graphs). This means that you can easily expect an actual running speed quite a bit lower than the nominal speed value. Also note that the program does not directly create these graphs. The program creates an output file containing all the raw data calculated by the program. You can then copy and paste this data into a spreadsheet like Excel and graph it. The software program is written in Fortran and made into an executable file, which you can run on your computer directly. It captures all the essential physics in Stirling engines. It is easy to use and usually takes less than a minute to run. The input data is easy to enter. Every input parameter is clearly explained, with diagrams where necessary. You don’t have to go through an installation procedure or change any settings on your computer, to use the program. You just download it and run it directly on your computer. The program will only run on a Windows based PC. It will not run on a Mac, Unix, Linux or any other system. To use this program on another system you need to install PC emulation software, which allows you to run Windows based programs. In general, you will not need a very large amount of disk space to use the program. However, you should have about 30-60 MB of disk space available for the times when the output file created by the program happens to be very large. All the files that come with this product are contained in a single (compressed) file, in the "zip" format. This file is 22.2 MB in size. You need to uncompress this file before you can use the program. Here's a sample output file created by the Stirling engine software program. To download the file right-click on the link. After downloading, the file can be opened with Notepad (in Windows). Make sure "Word Wrap" (in the Format menu) is not selected, otherwise some of the data won't display properly. The sample output file contains the program input at the very top. This way, you know the input corresponding to the results. Air is used as the working gas for the program input corresponding to this sample output file. 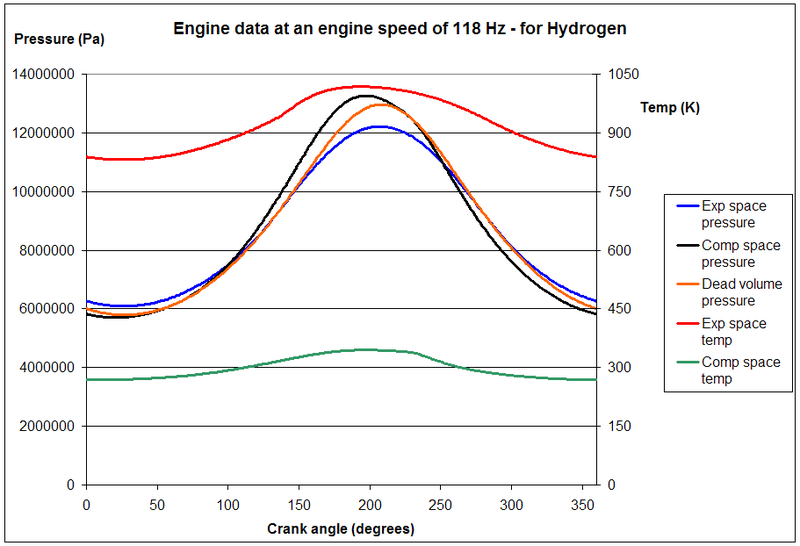 Engine performance data, such as speed and power, is given at the very bottom of the output file. I also did a simulation of the D-90 Stirling engine built by the well-known enthusiast Andy Ross. The design specs for the D-90 are given in pages 62-64 of Andy's design book (which I downloaded here: http://zigherzog.net/stirling/literature/books/makingStirlingEngines-2.pdf). In Andy's book it says that the maximum measured power of the engine was 230 Watts at 55 Hz rotational speed. My software predicts a maximum power of 182 Watts at 58 Hz rotational speed. On page 56 of the book it says that the measured free speed of the engine (the maximum speed reached by the engine under zero-loading) was about 5000 rpm (83 Hz). According to my software, the predicted free speed is 6240 rpm (104 Hz). So the software does a decent job of predicting engine performance. The specific output file created by the Stirling engine software program for the D-90 engine is available here. Note that it's a big file, 15 MB. 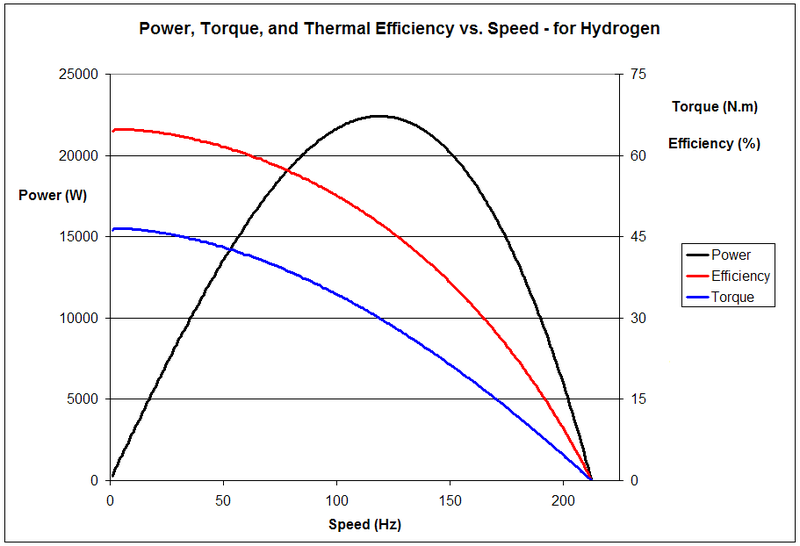 Here is some further reading on Stirling engine efficiency. The Stirling engine software and information manual is available for free through this link.